I promised a reader to answer a thoughtful provocation on Herta Mueller and I finally keep (or try to) my word. I am replying to Mr Mihail Lungu in regards to how opportune and appropriate was my declared enthusiasm for her work and her Nobel. Comunitatea etnică a şvabilor din Banat (atât cea rămasă în RO, cât şi majoritatea, emigrată în Germania) nu a salutat absolut de loc cărţile ei şi cu atât mai puţin acordarea Premiului Nobel, deoarece s-a considerat denigrată prin opera d-nei Herta Müller. Cam la fel (deşi, poate, din motive diferite, aici aprecierile literar-estetice au primat, cred eu) a fost şi reacţia cercurilor literare din România. Criticii literari din Germania au avut păreri foarte împărţite. In summary, Mr Lungu tells me to curb my enthusiasm, stating that her writing is poor, it's not authentic and doubts her sincerity as a person and is also suggesting that her writing had a quasi-universal bad reception. Mr Lungu has then gracefully provided a link to a longer expose on what irked him about her, personally ("în privinţa sincerităţii individului Herta Müller iată un mic exemplu") which you can find below, in sources (mr-cine). There, he presents a seeming contradiction (or inconsistency) between her position regarding Oskar Pastior, a possible "collaborator with the oppression apparatus" and the inspiration for her Nobel-winning Atemschaukel, and the way she treated an old friend from communist Romania for her confessed "pact" with Securitate, which she had to do in order to get her passport and escape to visit Ms Muller. As I tried telling Mr Lungu, I have not read enough of Ms Muller's work to form an opinion sufficient for a discussion of the kind he wants to have. But I promised an answer and, from the little I've read, her style is glacial and not exactly endearing. I did not "like" it much and that is why I did not read much either. As such, the first criticism, that her writing is not good enough, is not something I am willing to defend (it'd also make for a never ending debate). I also don't think that the Nobel Prize committee has a duty to choose literary works that are universally liked. I would argue that Herta Muller is a better choice than Bob Dylan because choosing HM opens an avenue previously unknown to many readers, while picking BD merely recognizes and confirms his immense popularity. There is also a shadow of regret and humility in her "not a writer" statement. Quite possibly, she sees her inability to marshal emotions as debilitating for a writer. She does vibrate to emotion, but it's mostly negative emotions that color her universe. "When I first heard Maria Tănase she sounded incredible to me, it was for the first time that I really felt what folklore meant. Romanian folk music is connected to existence in a very meaningful way." Reading her, I got the feeling that she did indeed experience paralyzing fear and her writing is an attempt to break free from it and possibly help others do the same. In this context, certain inaccuracies are permitted and should be forgiven even by the most severe critics. Perhaps the reason why for some of us that's hard is that we have a biased and unrealistic expectation from anything German to be precise and punctual. I had a number of such experiences in Germanic countries and freed myself of such silly expectations after my visit to German Switzerland, where buses never came on time, and my Swiss friend told me that it's quite normal; Simona Tache describes an experience similar in terms of chaotic travel (stache-germ). Could it be that she equates the Romanian part of her background with the burden of pain and suffering she seems to be carrying, and if so, is that wrong or inaccurate? Moving on to SophieHerta's Choice, i.e., her rejection of her long-time friend upon the confession of a to-be-expected "betrayal", that does not really need an explanation, but I will provide mine nonetheless. Firstly, I've never expected a writer to be likable in person. I don't fall in love with artists or entertainers, no matter how fulfilling the emotional experience they provide is. I don't like or vibrate with CTP's appearances on TV, but I devoured his Planetarium (we might find some bridges over a beer or chai, but what are the chances? ; I even used one of his stories as a backdrop to what I had to say about pain and creation). I've a friend who's a concert pianist, but no matter how moving and exceptional I find her performances, it would never cause me to date her. I could go on, but you see the point. 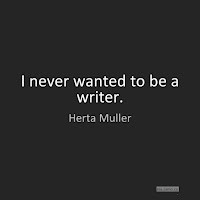 Even assuming that Herta Muller's personality is of zero value or even negative, that would still not affect my view of her work, and I don't think it should affect others' either. Secondly, I really don't see that act as indefensible or even wrong. All that she's done is she sent an old friend packing, a friend who was only visiting and while visiting her managed to pass on a threat to her life. If HM was indeed attempting to escape the realm of fear by immigrating, her friend had unwittingly brought on all that irrational and surreal baggage, reminding Herta that Securitate is not an organization, but an omnipresent state of mind. Would her friend have survived cancer if Herta would have let her stay until her visa expiry? The creative world is full of examples of women being friendly (and more) to men who did not deserve it, and in Pistorius' (or whatever his name is) case, there isn't even a clear indication that he was guilty as charged in the court of public opinion since he's dead and cannot defend himself. Maria Tanase, for instance, had that in the person of her last husband who was, arguably, living off her. Heidegger was undeservedly helped a great deal by Arendt and although such examples may rub the wrong our inner cowboy hero, they will continue to happen and are not something we can change or improve. Thank you for reading (mulţam fain pentru cetire)! Publicat Tuesday, December 20, 2016 . Similar articles under the following categories (poţi găsi articole similare sub următoarele categorii): cultura ( ), dezbate ( ), diaspora ( ), lucrand la fatada ( ) . Dacă ţi-a plăcut articolul, PinIt-uieste-l, ReddIt-eaza-l, stumble-uieste-l altora, trimite-l pe WhatsApp yMess şi consideră abonarea la fluxul RSS sau prin email. Ma poti de asemenea gasi pe Google. Trackback poateputea fi trimis prin URL-ul de sub Comentarii.